PHUKET: Governor Norraphat Plodthong has vowed to take action to correct Phuket motorists’ wild driving habits in the hope of reducing the death and carnage on the island’s roads. The announcement came yesterday (April 18) after it was reported that Phuket had suffered four deaths and 70 injuries in 67 accidents during Songkran “Seven Days of Danger” road-safety campaign, which ran from midnight at the beginning of last Thursday (Apr 11) through to midnight at the close of Monday (Apr 17). Gov Norraphat yesterday recounted the details of the four deaths. The other three deaths all came on Monday (April 17). 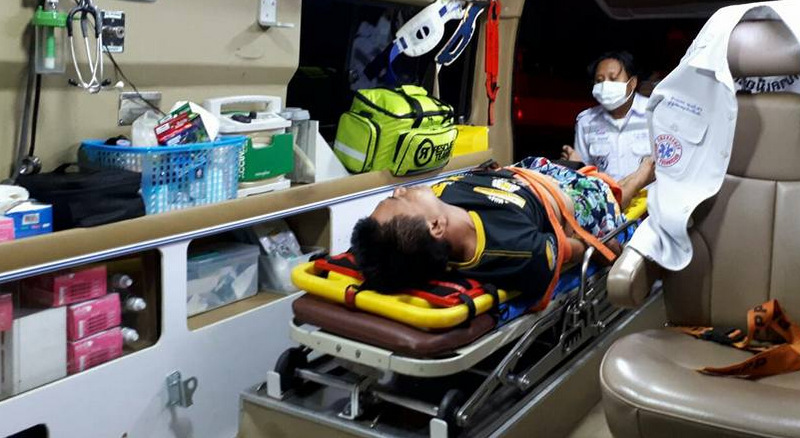 However, the black Monday on Phuket’s roads began when Peerapon Namsupo, 21, lost control of his motorbike at high speed and slammed into the roadside guardrails on Wichit Songkram Rd between Makro and Baan Ketho in Kathu at 4:29am. He died of his injuries later at Vachira Phuket Hospital in Phuket Town. “All these deaths and injuries happened because of driving at high speed, driving recklessly and not wearing helmets,” Gov Norraphat pointed out. “I will bring all the road accident statistics and other relevant information to discuss with the Phuket Provincial Committee to come up with ways to solve this problem and create a campaign that will make driving safer in Phuket,” he said. Despite the death and injury toll over the holidays, Gov Norraphat also thanked all police and officials who took part in the Songkran road-safety campaign, noting that without their efforts the death and injury toll could have been much higher. “Thank you to every official who worked hard during the Songkran holidays this year,” he said. All these deaths and injuries happened because of driving at high speed, driving recklessly and not wearing helmets,” Gov Norraphat pointed out. And he needs a meeting to discuss how to resolve this??? RTP do your job, enforce the law, no meeting required, there's your answer. Governor can safe his valuable time. Talks with Phuket Provincial Committee are useless, as they so far , it seems, never came up with a 'solution'. Governor just has to order and push the RTP to enforce traffic laws. Bring the speed violations down!